Shodan is a powerful tool for doing passive reconnaissance. It’s also a great source of information that you can put to good use to monitor your publicly available assets. Shodan acts as a search engine (also see: : What is Shodan.io? ), whatever that is connected to the internet will get indexed by their crawlers. 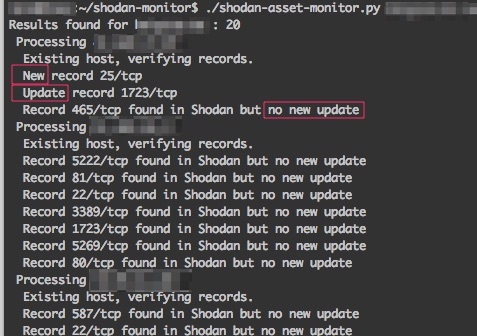 Note that ports that are no longer available are not covered and the script does not monitor service banner changes. Ideally you run the script from a cron job, for example every day. Set the configuration option PRINT_PROGRESS to False when running from cron. If you run the script from cron you might have to change SQL_LITE_DB to an absolute path instead of a relative path. This depends on your cron settings. Before you can run it you need to create the sqlite database. Obviously, when run from the first time it will generate a lot of alerts (all hosts and ports are new). You can disable mail notifications on the first run by adding a second parameter (‘any’ parameter will do, no specific value). You can make that change permanent by setting NOTIFY_MAIL to False. 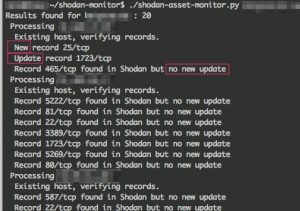 This will not notify you by e-mail of changes found in Shodan. The output will indicate if a new asset was found or if an existing host has changed.